We need you to get these things done if you are joining the team. The get on the Roster, pay Dues, and buy your Season Pass. -There you will find Club Snowboarding : which is 150$ for Full Year, $40 (only first semester), and $110 (only second semester). -Please double check that you selected club snowboarding and then press add to cart. You should be prompted to log in and then it will take you to the checkout. 5. On the home screen, click “Forms” in the left-hand navigation bar. 6. Click the new athlete form. Complete the form, making sure to answer all questions and give descriptions to “YES” answers. 8. Click “Submit Final” at the bottom. (You may also click “Save Partial” and complete at a later time). · All you need to do is attend a 30-minute class. The schedule for the classes is listed in the Club Sports Handbook on Page 3. You do not need to sign-up, but rather show up on-time (they will not let you inside if you are late), bring a pen, and bring your license. – Once you complete the online training you will need to attend a 30 minute in-person class. The schedule for the classes are listed in theClub Sports Handbook on Page 3. Thanks so much everyone and stay tuned for information about the first meeting!! What’s up BUSTies? Things are getting real out on the snow so we want to make sure that you guys are all set to have the most stellar season. Think of this as a checklist, if you don’t have all of this done – LET US KNOW! We’ll make it happen. 3. Buy Season Pass: Make sure you get the discount code from us at the meetings. If you can’t make it to the meetings, let us know! 5. Pick up pass: If you’ve been notified by Medina that she has your pass, then find her. If she doesn’t have your pass then it will be printed at the mountain. To be safe, go to the BU Registrar’s office and get a proof of enrollment letter so that the mountain won’t give you any trouble when giving you the discounted pass. Other stuff to remember so that you’re super prepared for the awesome season ahead: Next Meeting – Wednesday December 4. Don’t miss it, it could change your life. So it might not be snowing yet, but we’re getting stoked to start bonding with all of our members new and old. Keep checking our calendar for events and cool happenings that are snow sports or just generally winter related. We swear we’ll update it. If you have any questions, check on here first, and then shoot us an email (busnowtm@bu.edu) if you’re still out of luck. We like your emails, but we like our blog more. At this time, we’re still getting things up to date on here, but before you know it, you won’t even need us anymore. Anyway, welcome to all of our new 2013-14 members, and welcome back to our vets, we can’t wait to get riding soon! The Daily Free Press, BU’s own independent newspaper, wrote a stellar piece on us this week. The focus is on us going to USASA Nationals. Stoke the stoke! Do you want to support your team? You can! All you have to do is go to the link at the bottom of this post. You can send us money by credit card online or by sending a check in the mail. Under the “My Gift Information” section, in the “please direct my support to” question, scroll down past varsity sports to the club sports and choose “Friends of Club Sports: for Snowboarding.” Your gift will support our team in our weekly trips, competitions (including sending us to nationals! ), and maybe even sweatshirts. We would really appreciate it! * The contest will run for 3 months, with 1 winner per month. * Submissions end one week before the end of the month. * Top 10 go to a vote. * Must be an original picture. * You must provide us with a link to your blog, the image on Flickr, etc., with the link to our site as noted above so we can verify the link. * Image must be in landscape format and large – approximately 3000×2000 would be good so we can resize as necessary. Welcome back to Boston! We hope you had a stellar break. Let’s hang out this Tuesday, Jan. 12 at Barnes & Noble from 10am-7pm. We’re having a fundraiser for the team. Here’s what we’ll be doing: first of all, we’ll be on the floor where you pick up your preordered textbooks. We just meet people, look at a spreadsheet for a box number and then go in the back room and get the box and give it to the person. It’s super easy and last year we had fun chillin with each other. If you could give us a couple hours of your time, that would be fantastic. Email us back with when you can come or get on our facebook event. If you can come all day, that’s great! Wear comfy shoes and clothes because we’ll be on our feet. The Van Certification class is Tuesday Jan. 19 from 5-8pm at fitrec. If you need to become certified to drive, please use this registration link www.bu.edu/fitrec/signup/van and follow the login for BU students/faculty and staff. THIS IS ONLY FOR NEW DRIVERS. THIS IS THE ONLY CLASS OFFERED THIS SEMESTER. **Note** Drivers are welcome to take the course on their own at their own expense through the Massachusetts Safety Council if they absolutely cannot make this class. The link to that site is http://www.masafetycouncil.org/defensive_driving.htm. Just wanted to remind you that the Barnes and Nobles fundraiser is the day before classes start on Tuesday, Jan 12! Try to make it back for a couple hours to help us out. We don’t need you all day, but we’ll need people there all day. Van Certification class is Tuesday, Jan. 19 from 5-8pm. If you need to become certified to drive, please go to this website and sign up www.bu.edu/fitrec/signup/van. THIS IS ONLY FOR NEW DRIVERS. THIS IS THE ONLY CLASS OFFERED THIS SEMESTER. Drivers are welcome to take the course on their own at their own expense through the Massachusetts Safety Council if they absolutely cannot make this class. The link to that site is http://www.masafetycouncil.org/defensive_driving.htm. Our first meeting is Wednesday Jan. 13 at 9pm in CAS STO B50. Be there. We’ll have probably have extra sign-ups for the first trip to Stratton. We had our first competition the other day and Katie Moore came away with the gold x2 in Slalom. Congrats! Here is the final email of the semester! 2) Sending out a reminder email with proform stuff! Good luck on finals and have a great break! P.S. Katie Moore is competing before classes start so wish her good luck! In the first 6 weeks of 2010 competitors are entered in 30 events! Wow we’re going to make a great showing in Southern Vermont! We’re cleaning up Agganis after the hockey game to raise money for the team so that we can have more snowboarding, more events, and more fun! It’s essential that you’re all there! Our first trip is Jan. 17th and sign-ups for the trip are this Wednesday. Bring your ten dollars to the meeting next week. As you all know, Stratton hasn’t opened yet because of inclement weather this past week. 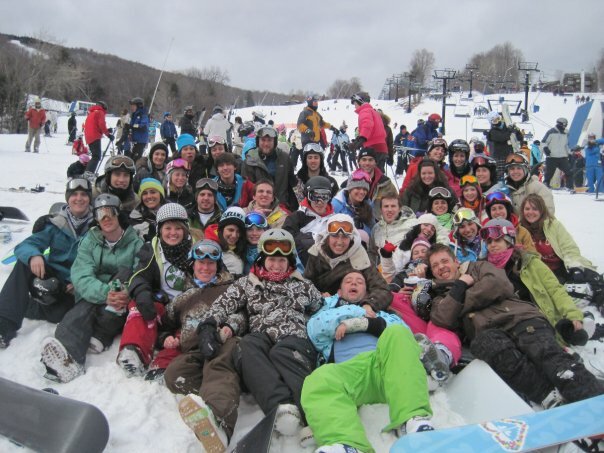 At Wednesday’s meeting we’re also going to be talking about Spring Break and the Sunday River trip. Please see the previous email to get the low down. Remember to email taldredge1@gmail.com if you are interested! If you want to ride over break at either Stratton, Okemo, or Sunapee, then you need to go to the Registrar’s office before you leave for Christmas break. The office is located on the second floor of 881 Commonwealth Ave. Ask for a registrar’s letter that verifies that you are a full time registered college student. Then you need to bring this letter with you along with your BU ID to the mountain the day that you go in order to pick up your pass. BUT! If you’re planning on picking up your pass at a mountain other than Stratton, i.e. you’re planning on going Sunapee or Okemo first, you need to email us back and tell us, so that we can contact Stratton and have them notify the other mountain. LipDub Event! It’s a type of a video, where it’s a singular shot that follows students who lipsync a song throughout the campus. We are filming this friday from 1-4pm as we will need to do several run throughs and make sure everyone is coordinating. We want support from every group on campus, and are looking for a solid 10+ people from the snowboard team to attend and wear their gear and just have a good time. Here are 2 examples of what we are trying to do. Our song is a mashup of Jackson 5’s ABC and I want you back. ThirtyTwo proforms are in! We’re going to do it similar to the way we do skullcandy: by request. We’ll have the cards at the meetings because they are a physical thing we need to give you. We also suggest that you buddy up so you can get multiple items per card. Chill is a six-week, learn-to-snowboard program for underserved inner-city youth. The youth we work with come from a variety of backgrounds, including foster care or group home situations, low-income public schools, juvenile justice systems, and drug rehab programs to name a few. Many of these youth lack positive role models, consistency of any sort, or the availability of positive extra-circular activities. As a volunteer you can help to change all of this. We ask that volunteers choose one day of the week that works best for them and attend Chill on that same day of the week at least three times throughout the six-week program. This arrangement creates consistency for the youth because the volunteers work with the same group every time. The days this year are Tuesdays, Wednesdays and Thursdays. It starts the 19th and goes on for 6 weeks from there including a possible make up day(s) at the end. We’ll leave around 4pm from campus and go to Wachusett. You help out the kids and then you ride until the mountain closes (around 11p). If you want to participate in Chill with BUST, please email busnowtm@bu.edu and we’ll put you on the list.